In education, the “roster” is a fundamental building block of instruction, assessment, and administration. Typically, a roster specifies the teacher and the list of students in a program, class, or section of an organization and they enable teachers to manage and teach students as members of a group. For example, by giving privileges to a roster, then all students listed on the roster may automatically access the materials and assessments assigned to the class. In educational software programs, instructional and administrative applications require a link between the students in a class/section and the teacher. Ideally, the teacher can then create a class roster once, identify the required software assets that the class may access, and update the software applications with the roster information easily and automatically. The expanding ecosystem of educational services (devices, applications, and websites) that students must access on a daily basis requires a simplified roster exchange solution. RIC One provides fast, simple and secure integration between a district’s student information system and multiple applications, including assessment, instructional and administrative applications. With only one login, this increases the time for teachers to teach and students to learn. Districts retain control of their data while in the custody of their RIC. RIC One is still in its final implementation phases. Currently there are 3 RICS and 14,000 kids integrated, with a further 2 RICS and 7,000 kids being integrated during April 2016, and finally in July 2016, 19 Lower Hudson Districts and 66,000 kids will be integrated. To explore xPress Roster further, please visit the RIC One sandbox. How does xPress Roster compare to other data standards? 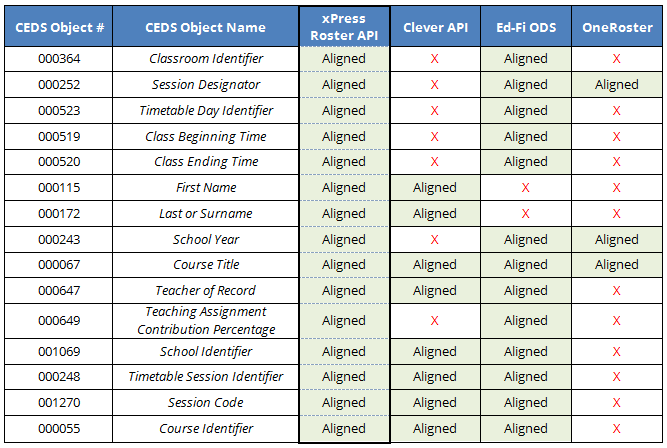 xPress Roster is the most comprehensive solution currently available from the marketplace that aligns to the Common Education Data Standards (CEDS).